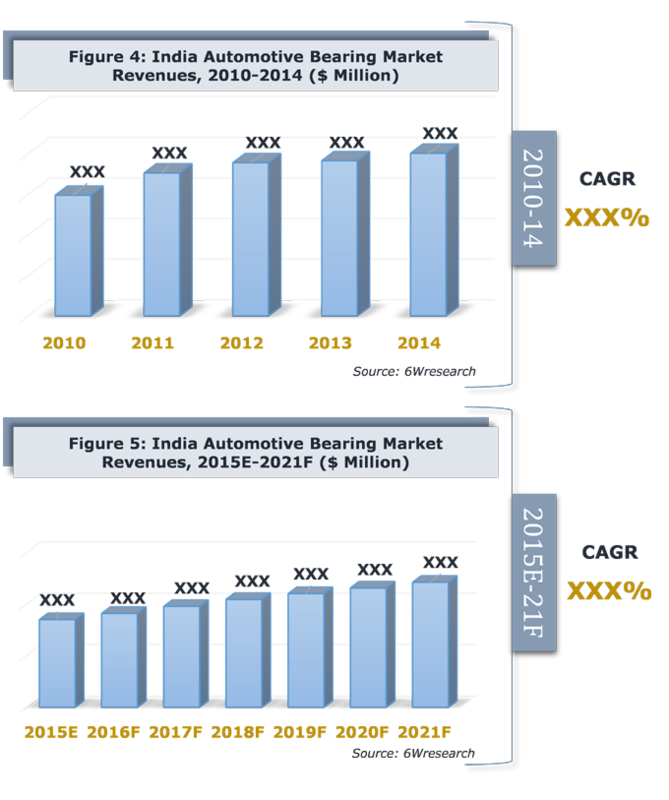 India automotive bearing market has been divided into three prime segments including sub-segments i.e. ball bearing (deep groove, angular contact, wheel hub & thrust bearing), Roller Bearing (taper, needle, cylindrical & spherical) and clutch bearing. After sluggish demand in last two years, India automotive bearing market is expected to gain momentum in the coming years. Rising consumer spending and initiatives taken by the government such as “Make in India” campaign would spur the growth of the market. According to 6Wresearch, India automotive bearing market is projected to touch $1.2 billion by 2021. Growing two wheeler sales is primarily driving the demand for ball bearing, wherein deep groove ball bearing leads the market. In the next six years, ball bearing segment would register higher growth over roller bearing and clutch bearing segments. With the launch of ‘Make in India' campaign domestic production of automotive vehicles is expected to increase in the forecast period. The initiatives would drive various international players to expand and establish their manufacturing facilities, thus creating huge demand for automotive components in the country. Further, opportunities to export the vehicles in the international market would fuel the market for automotive bearing. The report estimates and forecast overall India automotive bearing market by revenue, bearing type such as Ball, roller, and clutch; vehicle types such as two wheeler, three wheeler, passenger vehicle, commercial vehicle, off the road vehicle, OEM & aftermarket. The report also gives insights on price trends, market trends, competitive landscape, company profiles, market drivers and restraints. 12.7	Austin Engineering Co. Ltd.
12.10	INA Bearings India Pvt. Ltd.
India's automotive sector is amongst one of the leading automotive sectors globally. India's Automotive Bearing market is expected to grow on account of expected entry of new vehicle manufactures in the country, resulting into surging market for organized bearing players. Also, increasing exports for locally manufactured vehicles in various countries has further fueled the demand for automotive bearings. According to 6Wresearch, India Automotive Bearing market is projected to touch $1.2 billion by 2021. In India's automotive bearing market, ball bearing segment has generated majority of market revenue and volume. Wide deployment of these bearings in two wheeler and passenger vehicle segments has resulted for its market dominance. Amongst vehicle types, four wheeler market is the leading revenue generating end user segment in bearing market, where major demand is witnessed from northern, southern and western regions of the country. The report thoroughly covers the market by automotive bearing by types, vehicle types and regions. The report provides the unbiased and detailed analysis of the on-going trends, opportunities/high growth areas, market drivers which would help the stakeholders to device and align their market strategies according to the current and future market dynamics.